This bat clown mask, which is toothy and creepy, can perfectly help you add horror atmosphere on Halloween! 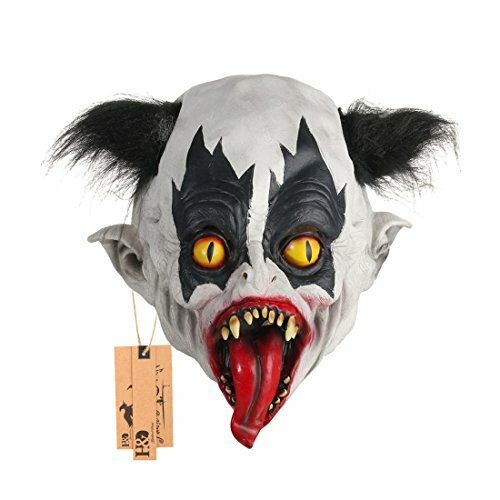 Toothy bat clown mask with black wig, perfect for creating horror effect. Suitable for Halloween, costume party, April Fool's Day, etc. Full head style for stable wearing. Made of safe latex material. 1. NOT suitable for people with latex allergies. 2. It is normal if the mask has the smell of latex, you can put it in a well-ventilated place to reduce the smell before use. 3. Please allow 1-2cm differs due to manual measurement. If you have any questions about this product by YUFENG, contact us by completing and submitting the form below. If you are looking for a specif part number, please include it with your message.